Thermoelectric coolers transfer heat using a direct current between two electrical semiconductors to cool a desired area. When used for electronic thermal management, thermoelectric coolers use two semiconductors, one positive and one negative, to decrease temperature at the junction. The low temperature at the junction absorbs heat, thereby cooling the surrounding area. 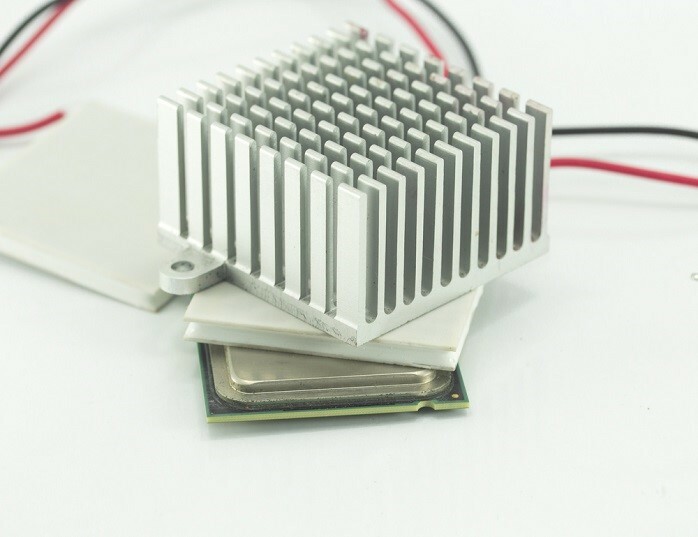 In cooling applications, the hot side of thermoelectric cooler is typically attached to a finned heat sink to keep it at ambient temperature. Thermoelectric coolers have a wide variety of applications such as printers, fiber optic systems, medical devices, and aerospace technologies. They have few moving parts and so require little maintenance. They have a long life, with a mean time between failures of over 100,000 hours. They are also flexible and small in size, do not create refrigerant emissions, and can be used in extreme environments with a wide range of ambient temperatures. However, they are also expensive, unsuitable for applications with high heat flux, and have a poor power efficiency compared to folded fin heat sinks. Looking for a Large Aluminum Heatsink Company?